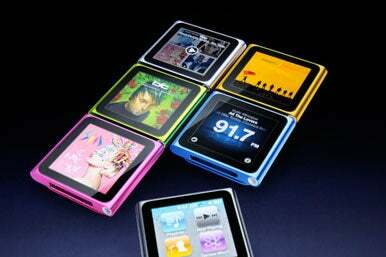 The iPod nano and iPod shuffles underwent the most dramatic changes in Apple’s annual overhaul of its music lineup, with the former getting a touchscreen interface and the latter restoring buttons to its control scheme. Apple CEO Steve Jobs introduced the revamped iPods at a Wednesday press event and made no bones about the new versions: “It’s the biggest change in the iPod line-up ever,” he said. 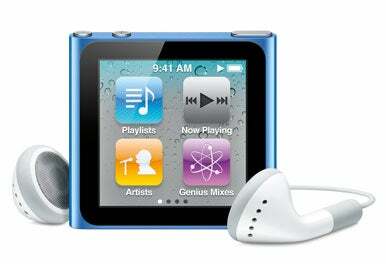 That’s no understatement when it comes to the iPod nano. The device has shed its Click Wheel interface for a multitouch interface that uses tap and swipe to control. Apple says the new design makes this nano 46 percent smaller and 42 percent lighter than the previous version. A slide during Steve Jobs’s demo shows off the latest nano in its assortment of colors. “Almost half as small, almost half as light as its predecessor,” Jobs said. To get the nano that small, though, Apple shed a few features. A built-in camera, introduced just last year to the fifth-generation iPod nano is gone, meaning users won’t be able to snap pictures and record video with the new device. They also won’t be able to watch video on the nano’s 1.54-inch color screen; instead, Apple is positioning this version of the nano entirely as a music device. The latest nano features an iPod shuffle-like video clip, making it easy for users to attach the music player to their clothing. It also features physical volume buttons, a Shake to Shuffle feature for summoning new songs, and VoiceOver technology to announce artists, songs, and albums. There’s also an FM radio, support for Nike+, a pedometer, VoiceMemos, a Photos app, and support for 29 different languages. According to Apple, the built-in battery can handle 24 hours of audio playback. Given that the nano’s software is entirely different from that of the previous version, Jobs gave a quick demo, showing off an interface that—if it’s not iOS itself—is certainly reminiscent of iOS devices. The device has multiple Home screens, each capable of holding up to four icons. As on Apple’s iOS devices, you can rearrange the icons by tapping and dragging them. Unlike iOS devices, there’s no Home button—you tap and hold on the screen to return to the Home screen. While you’re playing back a track, you can tap to bring up the controls as a translucent overlay over the album art. Just in case you clip the nano to your clothes upside down, you can use the two-finger rotate gesture to turn the Home screen. As with previous versions of the nano, there’s the usual 30-pin dock connector and a headphone jack. The new nano comes in seven colors—graphite, silver, pink, blue, yellow, and green, and a Product Red version. It will ship next week in two capacities: a $149 8GB model, and a 16GB for $179. Before taking the wraps off the nano, Jobs also unveiled the new iPod shuffle by first documenting the different iterations the device has gone through from inception to the button-less iPod shuffle that came out last year. 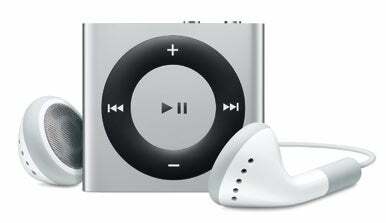 The aluminum exterior of the shuffle comes in five different colors: blue, pink, green, yellow, and silver. Like its predecessors it comes in a single 2GB capacity for $49. Jobs made no mention of the iPod classic, its high-capacity, hard drive-based music player during his presentation, adding fuel to the speculation that Apple may have finally killed off that part of its product line. However, the classic appears to still have a home at Apple, retaining its very own Web page. In addition, the Apple Store still lists the 160GB music player as selling for $249. Updated at 1:30 p.m. PT to include more information throughout the story.